This manuscript is not available yet. Thorndike, Maine: Thorndike Press, 1999. 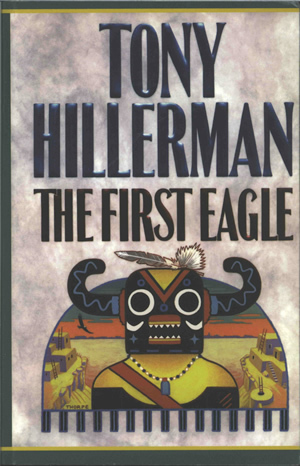 This is the large print paperback edition of The First Eagle published in 1999 by Thorndike Press in Thorndike, Maine. It features Peter Thorpe's cover art from the original edition. The front cover displays the author name and novel title in large purple print above Thorpe's illustration of a kachina masked figure, somewhat resembling Ahote kachina, standing in front of a half moon shaped frame containing a Pueblo cliff village and an eagle swooping through a southwestern sunset. The back cover displays a synopsis of the novel printed in black on a white background, above the bar code and cover credit. The spine is dark green and features the Thorndike large print designation, author name and book title, detail of the front cover drawing, and publisher's imprint. Binding: Full-color paper covers. The spine is dark green and features the Thorndike large print designation, author name and book title, detail of the front cover drawing, and publisher's imprint.